Music Department Excels in the Spring! Cougar Media experienced journalism and media entertainment in action at NBC Studios in New York City. 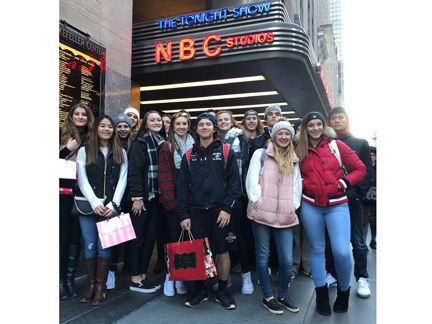 Students from Cougar Media News, the Cougar Chronicle, Palm Echo, and Introduction to Mass Communications classes toured the sets of Nightly News and Saturday Night Live, as well as live control rooms that featured sound, design, and editing. They produced their own version of a late night talk show, and some students got to attend Jimmy Fallon's monologue rehearsal. In addition to the tour of the iconic 30 Rock building, Cougar Media enjoyed the holiday spirit in Rockefeller Plaza and Times Square.